"I was always in awe of Anna Magnani... She never exhibited any lack of self-assurance… and she looked right into the eyes of whomever she confronted, and during that golden time in which we were the dearest of friends I never heard a false word fall from her mouth." Perhaps it is easier to believe in magic when the setting is a city as enchanting as Rome. Perhaps, too, we no longer live in a time and place where a writer can set out to meet an actress that so completely captivates him, unfettered by the managers, agents and handlers that accompany many of today's not-so-bright stars. And that such a meeting would result in a remarkable friendship which would endure two decades and inspire three theatrical master-works, is almost unimaginable in today's contrived and calculated world of artless entertainment. But there was magic in the air in the winter of 1949 as Tennessee Williams arrived in Rome for preparations of the Italian production of "A Streetcar Named Desire." Williams was desperately seeking a woman he had tried in vain for three years to contact by mail and telegram. A woman he would call upon friends and acquaintances -from Gore Vidal to Roberto Rossellini and Vittorio deSica-to arrange a meeting with. A woman of whom he once said: "It is not often I am profoundly moved by a performance on the screen, but this woman, Anna Magnani, has sunken the claws into my heart... I feel inspired, perhaps compelled to write a play for her" (T.W. 's diary entry 1947). The play would eventually become "The Rose Tattoo". The inspiration would not stop there, in the end both "The Rose Tattoo" and "Orpheus Descending" were inspired by and written expressly for La Magnani, and "Sweet Bird of Youth" would have its roots in Williams' fascination with the great actress. Their lives and careers paralleled one other, from anonymity to world fame to abandoned legends; they were inextricably linked in heart, mind and art. In a way it makes sense that two of this century's greatest contributors to the theater would come to embody the classical paradigm of the artist and the muse. At a time when Italy and the United States of America were recovering from a war that held them as mortal enemies, Anna and Tennessee would come to symbolize the enduring love affair between those two countries. 'Exiles' would be Williams' preferred expression of his kinship for Magnani, though Magnani was partial to the word 'avantisti' (ahead of the times). Their individual approach to leading non-traditional lives was as different as the cultures from which they hailed. Williams, whose penchant for creating scenes in public places and pushing the limits, was contrasted by Magnani's cool, effortless romanissima way of life. Magnani provided a loving and stern maternal figure who understood the mind of a theatrical genius and also appreciated his often intense and erratic disposition. It was not Tennessee's drinking or flamboyance that would raise Magnani's ire, nor his melancholy or paranoia. Not even his philandering perturbed Magnani. Except in context of his love for -and lack of monogamous devotion to- his longtime companion Frank Merlo, to whom Anna was also very close. Betrayal was the only thing Magnani would not tolerate. Whenever Tennessee verged on such transgressions, it was Anna who would pounce, lion-like, on the great writer. Over the years Magnani herself was on the receiving end of some of Tennessee's verbal indiscretions -in particular his choice words to the press regarding her participation in the incommensurate and mawkish "Secret of Santa Vittoria". She did not indulge him as many of his closest peers and associates. A woman all too familiar with the frailty of man's fidelity, her great capacity for compassion ran anemic in the face of voluntary betrayal or as Tennessee referred to it as 'a deliberate act of cruelty'. Anna inspired simply by living her life the way she did, purely, bravely, and relentlessly. The exhilarating spring and summer nights on Magnani's terrace with its stunning panoramic view of the eternal city was the backdrop of this inspiration for Williams in the 1950's. Tennessee was keen on spending spring and summer in Italy and he was completely enchanted by la bella Roma and its most famous resident. He once wrote: "it is a city that Anna seems to preside over, not like a queen but rather a goddess." Their friendship, born out of a deep appreciation and a complex understanding for one another as artists as well as human beings, was forged on that terrace above the Piazza Minerva over looking the Pantheon where the two talked and confided for hours on end for over twenty years. It is no wonder that the characters of Serafina in "The Rose Tattoo" and Lady in "Orpheus Descending" are mesmerizingly close to the Anna Magnani we were only vaguely allowed to see in real life. They were facets of her deeply rich and alluring personality. Born in Rome, Magnani was raised by her grandmother who eventually sent her to an acting conservatory where she sang and played the piano. The world never knew this side to Anna Magnani. In the post war era and boom of neo-realist cinema it was simple and effective to have her known as a 'non-actor' and as an 'earthy peasant woman'. The truth could not have been more different. A Romana di Roma, Magnani was hardly a peasant girl. She was a street-smart kid with a solid education and a passion for the theater. In American newspapers and cinema magazines however, the complex life of this woman was reduced to a caricature. There is an insightful and intriguing irony when we note that Anna Magnani lived so far from the conventions of the society and culture that loved and adored her. Magnani was clearly a woman well ahead of her time and she lived her life completely on her own terms. She alone raised her son, Luca, who was stricken with polio at age two, and had the boldness to give him the last name Magnani. Anna also demanded equality on the set with her directors and off the set with friends and lovers. 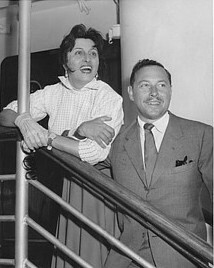 It was the fierce determination and assertiveness, which helped to create the awe that surrounded the name Anna Magnani, and Tennessee Williams was one of the few who was allowed to see her tender, vulnerable side. Tennessee was intrigued by her complexity and was inspired by her determination, yet there was something that set her apart from Tallulah Bankhead, Bette Davis, and Elizabeth Taylor. What could it have been that Williams first saw in that heartbreaking scene in Rossellini's "Roma: Citta` Aperta" / "Open City"? Passione. An Italian characteristic that Anna deemed a Roman virtue. As Tennessee was drawn to her, his work began to change. This artist/muse relationship -born of the ancient Greek paradigm-can be credited with a particular evolution in the work of Tennessee Williams. It was not until Tennessee fell in love with Rome and his subsequent friendship with Magnani that the female characters in his plays began to blossom into fiery, sensuous women. The women who inhabit the world of Williams' plays from his first endeavors into playwriting in the 1930's through his more sophisticated early plays "Not About Nightingales", "Summer and Smoke", "The Glass Menagerie", and to some degree "A Streetcar Named Desire" are all Southern women who are sexually detached -if not repressed- and clearly dominated and made victims by the men in their lives. No doubt influenced by his own insular world set in the conservative Christian South of Mississippi. to film The Rose Tattoo, September 1954. In his plays after 1950 the woman are passionate, complicated, self-assured, prepossessed, and sexually vital. Tennessee Williams would become known for his complex female characters that were imbued with a dimension, texture, and eroticism, not yet seen on the American stage. It is not a coincidence that after his friendship with Magnani one begins to see a major shift in the character-ization of the Williams women. 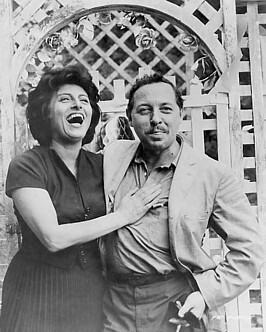 With the Williams/Magnani alliance we see a very different kind of woman inhabiting the infinitely rich and poetic plays Tennessee Williams gave the world. Though Magnani clearly inspired the characters of "The Rose Tattoo" (Serafina and Rosa), "Orpheus Descending" (Lady and Carol), and "Sweet Bird of Youth" (The Princess and Heavenly), further examination reveals reflections of her in Maggie in "Cat on a Hot Tin Roof" and Maxine in "Night of the Iguana". If it is accepted that artists are inspired by their muses, then it is a likely conclusion that it was La Magnani who inspired Tennessee to create many of these (now iconic) female characters, who today have their rightful place in the pantheon of World Theater. While Magnani did not realize the role of Serafina on the Broadway stage as Tennessee had dreamed, she went on to star in the film adaptation of "The Rose Tattoo", directed by Daniel Mann and co-starring Burt Lancaster. In March of 1956 the Academy of Motion Picture Arts and Sciences would award Anna Magnani an Oscar® as Best Actress for her performance. The film was an enormous international box office success with Magnani winning countless international awards. Four years later, in 1960, Magnani starred in the film adaptation of "Orpheus Descending" entitled "The Fugitive Kind", directed by Sydney Lumet and co-starring Marlon Brando and Joanne Woodward, and for which Magnani would receive many awards including the 1960 Foreign Press Association's Golden Globe for Best Actress. While separately both had been at the top of their respective fields for over a decade, together, with two films in just five years, Tennessee and Anna had conquered the world. There were even more plans for collaboration but various issues arose at this time -both personal and professional- that prevented Magnani from doing the Broadway productions and the films of "Sweet Bird" and "Night of The Iguana". Yet the two of them continued to meet up for their famous Roman nights, in which (along with dining and drinking) they would plan to work together again and support each other's creativity. The relationship between Williams and Magnani was truly synergistic: contrasting and complementary. Their friendship endured the well-known tests of time, which, in the treacherous and disposable world of Hollywood, is all too rare. The Fugitive Kind, July 1959. As the two entered their 60's, it was a bitter irony that Anna and Tennessee would be revered internationally yet discarded by their native countries. Much of the 1960's and the 1970's would find Williams cruelly savaged by critics and vilified by homophobic editorialists and politicians. As early as 1960 the parts normally reserved for Magnani would start to go to Sophia Loren and throughout that decade most of the roles offered her were beneath her talent. Meanwhile in 1963 Williams had buried his lover Frank Merlo, and was having increasing difficulty getting his new plays produced. In a time of personal and professional turbulence the two artists would take refuge in the sanctuary of Anna's majestic roof-top terrace. As the 1970's began both Tennessee and Anna were feeling the sting of rejection and disappointment. The indomitable Magnani returned to where her career had started -the theater. She was triumphant on the European stage in sold-out productions of "Medea" and the acclaimed Zeffirelli production of Giuseppe Verga's "La Lupa". Magnani was doing some of her greatest work and yet the great film roles eluded her. Appropriately her last film appearance would be an intriguing cameo as herself in Fellini's "Roma". Although Anna and Tennessee continued to work on various projects and the two planned to collaborate again, time was not on Anna's side. Magnani died at age 65 of pancreatic cancer in September 1973. Anna's death, at a time when so many of Williams' friends were dying, was in many ways a coup de grace for the sensitive playwright. This loss left him so emotionally devastated he was unable to attend Magnani's burial ceremony, which shut down the entire city of Rome. To this day many people wonder why Tennessee sent twenty dozen roses to her funeral. The answer is simple; alle venti (at 20:00) - 8o'clock was the designated meeting time on Magnani's terrace for conversations, cocktails and confessions. That magical, inspirational place that overlooked the city that had captured Tennessee's heart. "Ci vediamo alle venti"or "see you at 8", was how the two signed their telegrams and letters and often ended their late night Roman meetings with a date for the next evening. And this is why Tennessee Williams sent twenty dozen roses to the woman, friend and muse who forever would embody the "Rose" in one of his most acclaimed plays. The muse never really dies, like the goddess of Rome that Williams first likened Anna Magnani to, her spirit endures forever.